There used to be much more to this island. When the land was still arable, there were communal gardens. Watermelons, figs, fruit trees. A schoolhouse and a dance hall (which also served as a community center) once stood on the main avenue. Behind the houses, locals say, there used to be a forest, and the tribal elders knew which trees and shrubs to cull for medicine. Otters, armadillos, racoons, and rats were good for hunting, their furry hides used for clothing. And with fresh water on one side of the island and salt water on the other, the fishing was bountiful. 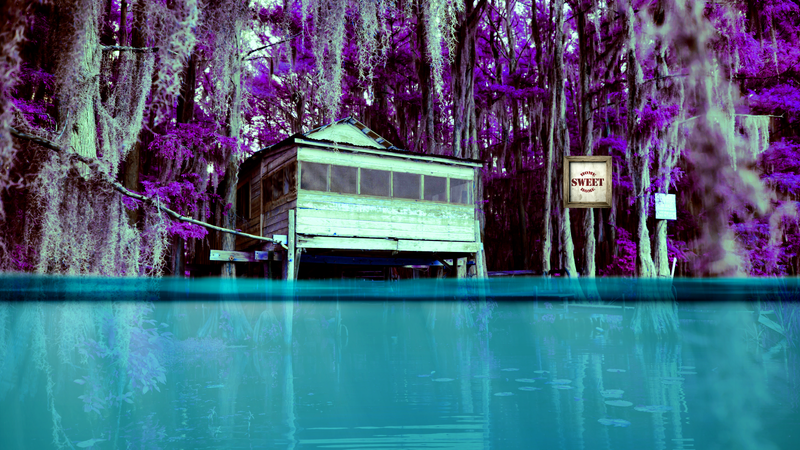 Those days are long gone for Isle de Jean Charles, a farflung island deep in southern Louisiana's bayou country. Today, ramshackle houses line the island's sole avenue, many dilapidated after repeated flooding. Most are now up on stilts as high as 16 feet. Many are empty. Due to a combination of climate change and human factors, only about 320 acres of Isle de Jean Charles remain above water out of what was once about 22,400 acres, according to state reports—a decline of 98%. Its population, which once peaked at around 400, has been whittled down to about 80. The otters and armadillos have fled for higher ground, and so have all the young people. Chief Albert Naquin, a traditional leader of the Native American tribe that has inhabited the island since the early 1800s, has already fled, and for years he has been persuading holdouts to follow him into exile. "We were thinking this global warming thing was coming in the future, but doggone, it's happening now" the chief told me recently. Chief Albert, like every other member of the Isle de Jean Charles Band of the Biloxi-Chitimacha-Choctaw, is now officially an American climate refugee. In January, in response to the island’s ongoing environmental crisis, the Department of Housing and Urban Development (HUD) allocated $48 million to relocate the island's entire native population to a "resilient and historically contextual community" on higher ground, miles inland. Those who have already fled will be included in the plan. It marks the first time the federal government has offered to relocate an entire population due to climate change and rising sea levels. The plight of Chief Albert’s tribe seems to confirm some of the worst predictions about the future of climate change. For years, environmental justice advocates have argued that the impact of a changing environment will hit the most vulnerable people first and worst. Just this month, the White House issued a report which found that "climate change will have the largest health impact on vulnerable populations," including "those with low incomes" and "Indigenous peoples." In other parts of the country, like Miami and Boston, governments are spending millions to protect real estate development along the coasts from the increasingly real effects of global warming. But down here in the bayou, rather than protecting, it seems the government is keen on buying the poor Native Americans out. All that remains of the home Chief Albert grew up in are a few fence posts peaking above the waters that have overtaken the property. "You can’t walk on there," he recently told me. "And we used to have a house there. We used to pass cars there." It was in 1974 when he first saw the writing on the wall. Hurricane Carmen left 11 inches of water in the home. His furniture was ruined, he remembered. All the appliances he had acquired as a newlywed were destroyed. Mold and rot set in. The decision was clear: rebuild his life on the island or get out. So the chief, a burly man with a boyish grin and knuckles like the tusk of an elephant, bought a piece of land a few miles away on the mainland. “Since 1974, I've never lost a piece of furniture due to a hurricane,” he said proudly. The same can't be said for other members of his tribe. Time and time again, the homes have been flooded as the island has steadily been slinking into the Gulf of Mexico. For about 15 years now, he has been trying to convince his people that it is time to say goodbye to the island, to no avail. Finally this year, with news of HUD’s resettlement agreement, he was able to get nearly everyone on board to leave the island. Nearly everybody. A few tribe members are so rooted to the island and its traditions that they still don't want to leave. One of the first things I saw when turning the bend on Island Road was a pair of homemade signs reading in part: "We are not moving off this island. If some people want to move they can go. But leave us alone." Edison Dardar, 67, who wrote and signed them, walked out to the car and offered a defense. "This is ours. We paid our taxes on it," he said. He walked back towards his home, grabbed a bucket and looped back around. "See dat," he asked in his thick drawl, hinted with the French Creole that is still a first language to most of his generation. A small handful of shrimp were in it, an early morning catch. "That's what we got on this island. I go from that, what else I got?" Nothing can take him from here, he said. He's lived here his entire 67 years, like his father who lived here for 91 before him. One day he will die here, he said without reserve. All of the young people tend to move out as soon as they can and look for jobs on the mainland, locals say. It already has the feel of a ghost town. The road to the island has been raised and repaired three times since it was built in the 1950s, but it still sees periodic flooding because of high tides. Now, the Federal Emergency Management Agency (FEMA) will not repair the road again, nor will it pay for damages done to residents' homes. Under the HUD agreement, residents fear the government is wiping its hands of any disaster relief funds for rebuilding on the island. They are still eligible for federal dollars appropriated by Congress after disasters, but already complain that in recent years the payouts have been severely slashed. Residents can keep their current homes as second residences, but once that big storm comes, they fear no more money for rebuilding will be allocated. Conceptual rendering of the proposed new Isle de Jean Charles community, just north of Houma, La. The exact timeline for the construction and the move is unclear. Regardless of when it happens, the current situation has already taken a toll on the tribe. It's harder than ever to make a living off the land. Religious services no longer take place on the island. Siblings, sons, and daughters have been separated from their families. Some weeks, Chief Albert hardly has a chance to pass by to engage with the community. In a very real way, residents say, the community has ceased to be as close-knit as it once was. "I best be for the move, because I'd hate us to lose more than we already have," said Chris Brunet, 50, a lifelong resident, reluctantly acknowledging that he is willing to move away. "Whenever you're faced against Mother Nature or the Gulf of Mexico, what is it you can do?" The tragedy of Isle de Jean Charles is a man-made, climate change-induced disaster. The list of culprits for the current situation is a tangle of causes and effects, at times difficult to distinguish. But the end result is in line with the worst predictions of a future marked by climate change: vulnerable coastal populations displaced and left behind. Long ago, when the Mississippi River had its annual flood, huge amounts of sediment used to be deposited through the marshes of southern Louisiana. Over millennia, those deposits built up the wetlands, creating high ridges and islands in some areas. Geologically, this is how Isle de Jean Charles came to be. But a historic disaster changed that, spurring human development that would fundamentally change the region's environment. In 1927, the Mississippi experienced the worst river flood in the nation's history, killing over 250 people. The national disaster lead to the federal government building the longest system of levees in the world to control the river and prevent future floods. “Since they levied the Mississippi after the Flood of 1927, all of that sediment is being thrown off the continental shelf and not into the bayou," said Mart Black, director of the Coastal Restoration and Preservation department of Terrebonne Parish, the local government. "Essentially, it's all being wasted," said Black. Unidentified stretch of the lower Mississippi River during the Flood of 1927. Without the annual inflow of silt coming from the river, erosion and land loss has become an accelerating problem in the region. Particularly vulnerable to this changing reality are the Native American communities in southern Lafourche and Terrebonne Parishes, an area which includes Isle de Jean Charles, according to a 2014 Tulane University report detailing the impact of land loss. In fact, while Isle de Jean Charles is an extreme outlier, other areas in the stress zone have already lost up to 40% of their populations, while areas just to the north are seeing significant population gains, according to a 2015 state report. "Louisiana must reshape underdeveloped, high-ground corridors in anticipation of future population and economic growth," found the state report, which aligns with the resettlement effort that is underway at Isle de Jean Charles. Yet there are many other factors at play besides the damming of the Mississippi. As the flow of freshwater and silt from the Mississippi has been cut off, saltwater has been moving in and taking its place, compounded by rising seasonal tides and tropical storms that locals say have been getting more violent and more frequent in recent years. When the saltwater pushes deeper into the bayou, the freshwater-dependent marsh grasses die, and those patches of semi-solid ground wash away into the waves. Oil companies carving up lines through the marsh for drilling have made more areas susceptible to erosion, as more surface area is exposed to the salt water. Locals, without much other industry to speak of besides fishing, have come to depend on payments from the oil industry to supplement their own livelihoods. Taken together, it explains why this part of Louisiana accounts for the vast majority of wetland loss in the continental United States. “I would say: ‘get the hell out of there.'" In an effort to combat the loss, the 92-mile long "Morganza to the Gulf" levee system is currently under construction. The multi-billion dollar project, when completed, will stand as a massive feat of engineering, with special flood gates that can either let water in or out, as needed. Efforts to secure federal funding for the project have repeatedly stalled, so local governments have taken on the project alone. "If we wanted to build it in our lifetime, we figured we'd have to tax ourselves to do it," said Black, of Terrebonne Parish. The only problem is, Isle de Jean Charles is not included in the final plans for the project. Currently, the remaining sliver of land is barely on the wrong side of the only major engineering effort currently underway to halt the land loss crisis. It has been written off, even by those who could save it if they could. So what does that mean for anyone living out there in the "not much protection" zone? I ask Black. “I would say: ‘get the hell out of there,'” he said. Sitting underneath a wooden gazebo at his home a few miles from the island, Chief Albert of the Biloxi-Chitimacha-Choctaw tribe talked frankly about the federal and state government's plan for the area. "There’s no plan in the master plan to restore," he said, referring to Louisiana's $10.3 billion Coastal Master Plan, which is separate from the HUD relocation funds. "And restoration— even if it was started today — it would take 60 years to be equal to rebuilding what’s already washing away." The fact that the proposed resettlement site on the mainland will have a cemetery will be important to the tribe, since there are ancestors currently buried on the island. While it's on some of the highest ground available, it is still highly at risk. "My grandparents might be underwater someday, but hopefully I won't be," said the chief. "And when that happens, that's what this will be. A whole new beginning for us." Correction: An earlier version of this article stated that under the HUD agreement, Isle de Jean Charles was no longer eligible for disaster relief funds. Those funds are appropriated by Congress.